Vanaire designs and manufactures Mist Eliminators with a guaranteed 99% efficiency rate in capturing particles as small as one micron. The technology in Vanaire’s Mist Eliminators outperforms wet scrubbers in its ability to capture airborne particles, whether organic or chemical based. Mist Eliminators, sometimes known as entrainment separators or demisters, are designed to capture and collect airborne contaminants found in process air emissions. Emissions in manufacturing and industries facilities typically contain oil compounds, machine coolant mist, chromic acid mist, sulfuric acid mist, and other airborne compounds. Vanaire Mist Eliminators are suitable for almost any application or industry producing acid mist, alkaline mist, oil mist, and even mists from organics. Our Mist Eliminators are built with durable and corrosion-resistant materials, such as stainless steel, PVC, and polypropylene, and feature the latest Composite Mesh Pad technology for easy maintenance access. Call the Vanaire team to place an order for your facility’s custom-designed Mist Eliminator. Talk to our engineers to design and fabricate a Mist Eliminator according to your particulate and efficiency needs. 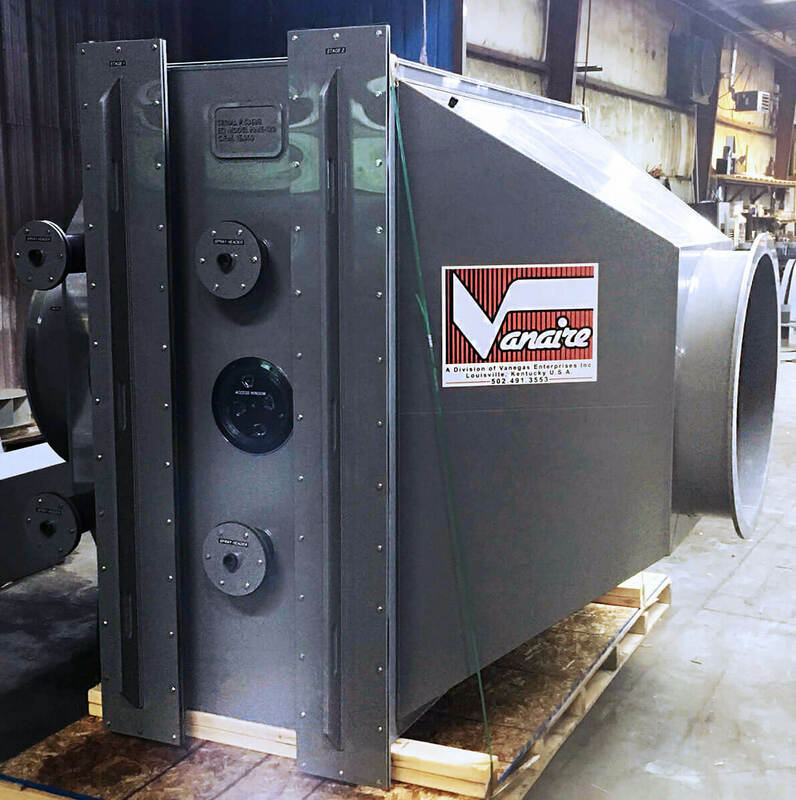 Here at Vanaire, we design and construct affordable entrainment separators with high-performance features. Built to satisfy, the equipment covered in this category is designed to match your manufacturing needs. That means that there are comprehensive mist elimination solutions available, plus a singular series of building entrainment separation solutions. If they don’t perform effectively, we can custom-shape their features and functions until they precisely match our clients’ needs. Consummately manufactured, Vanaire high-efficiency oil mist eliminators guarantee exceptional filtration power. Operating at low differential pressures, the industrial-strength oil mist eliminator utilizes 0.25 Micron filtration technology to collect 99.99 percent of all airflow-contaminating oil droplets. Mist eliminators play an important part in process air scrubbing at manufacture. Vanaire has been refining the design of really effective mist eliminators to provide customers with high quality ventilation systems. We use firm, durable, corrosion resistant fiber reinforced plastic that prevents untimely wearing out of the equipment and provides effective performance of an eliminator. The PVC (Poly Vinyl Chloride) materials used in our manufacturing works are built tough, so tough that our manufacturing department knows they’ll facilitate a fabrication process that results in our highly endurable mist elimination equipment. As self-evidenced by this pairing of production expertise and material durability, Vanaire’s PVC Mist Eliminators are certain to endure and wholly remove every conceivable abrasive contaminant from every process stream, especially when that stream develops as a mass of misty droplets.